This post is a sponsored post and the giveaway is also sponsored. However, the opinions expressed within are strictly my own and I receive no compensation for any sales through links. UPDATE: This giveaway is now closed. Many thanks to all who entered. Congratulations to Robin who left the following comment: “The alpine look delish!” Please stay tuned for an exciting upcoming announcement regarding a special event for the holiday season! Recently, I shared a post re-introducing Caveman Cookies as one of my gfe sponsors. I’ll recap some of what I shared then. Caveman Cookies are a great fit for the gfe approach. The ingredients are nuts, fruit, and honey. That’s it. No preservatives. It’s hard to decide which gfe category they fit into best … real food and recipes made from real food? Yep. Mainstream processed foods that are gluten free? Well, they are available throughout the U.S. and even in some international locations (and distribution is expanding daily), and they are made into cookies in a dedicated gluten-free facility. And finally, gluten-free specialty products for basic gluten-free needs or an indulgence? These cookies definitely appeal to a special audience and are not found in your basic grocery store. But the part about need or indulgence? I’ll let you decide on that one. I’m totally biased as I am a big fan of Caveman Cookies! Caveman Cookies was founded by Stephanie Lester. She was baking and enjoying these cookies herself and decided there was a need in the marketplace for her cookies. Caveman Cookies are naturally gluten-free (and not only made in a dedicated gluten-free facility, but also certified gluten free by GFCO), naturally dairy-free, naturally refined sugar free, naturally egg-free, naturally soy-free, kosher, paleo, primal, and vegetarian, so they readily work for many dietary lifestyles. You can see the specific ingredients for each variety of cookie (Original, Tropical, and Alpine) as well as the individual nutritional breakdown via the FAQs page. You can read more on the Caveman Cookies story here and check out the answers to all the FAQs here. FYI: If you want to order Caveman Cookies online, they are currently on sale through November 26 for 10% off. (Click here to get discount code and order. Note that there is a flat rate for shipping.) 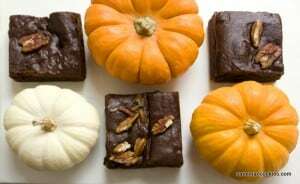 Even if you don’t want to place an order right this second, Stephanie has another great treat for you on Caveman Cookies’ discount page—a recipe for Paleo Pumpkin Pecan Brownies. Gluten free, grain free, dairy free, and refined sugar free, these brownies are just dying to be made at my house. Make some brownies now and enjoy your Caveman Cookies later when your order comes in or enjoy LOTS of Caveman Cookies for free if you win this giveaway. Yep, I finally got to the giveaway part! Stephanie and Caveman Cookies are giving away all of the following to one lucky gfe reader. You can view all giveaway items here. ~ Tweet about the giveaway. Leave another comment. ~ Share the giveaway on Facebook. Leave another comment. ~ Like Caveman Cookies on Facebook. Leave another comment. ~ Like gfe on Facebook. Leave another comment. ~ Get recipes and info from gfe in a reader or by email. Leave a comment. 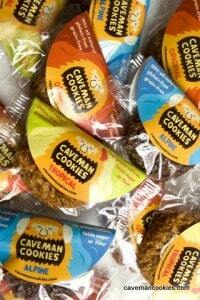 Oh the things I would do to try just the Original Caveman Cookie! Enter me please! Caveman Cookies liked on FB! Subscribed via google reader! Nom nom nom! These caveman cookies, especially the tropical ones, sound really good. I would love to win! Please, put my name in! (I love that they are made with NATURAL ingredients). They all sounds good to me, but if I have to choose, I would say Tropical. I think the Tropical cookies sound amazing! Liked Caveman cookies on FB. Would love to try these and the drawing is on my son’s Birthday so maybe that will make me lucky. I signed up for the GFE newsletter via email. I like Caveman Cookies on Facebook. I think the original cookies sound the best but id love to try all three. They all sound great! The original sounds great to me. I love a spice cookie, especially a good one that I didn’t have to make. Oh those Alpine cookies sound divine. Hazelnuts, my favorite! I “liked” Caveman Cookies on Facebook. Can’t wait to try the pumpkin brownie recipe. Looks fantastic. I’d love to win to share these with my celiac support group. Thanks! oooh! after i saw your post on these i haven’t been able to stop thinking about them! the original sound just perfect! I like gfe on Facebook. Thanks! Being on a strict diet because of celiac disease and numerous food allergies/sensitivites, I have been wanting to try these cookies because they contain things I CAN eat. Unfortunately, they are much expensive for me to spend money on, considering I don’t even know if they will taste good. SO, I would LOVE to win these cookies (especially the Tropical variety). Like GFE on FB. So many great ideas! Oooo.. they all sound good but the original cookie is calling to me. Just saw these on the shelf @ Lifethyme here in NY. I am exclusively GF since GI surgery 2 years ago (doing great)and have been experimenting w/ paleo recipes recently. I love to cook but as a teacher I don’t always have the time. These look great. They all sound really awesome right now! The tropical tho has ingredients that really “speak” to me 🙂 . . . . . Would love love love to try these since they aren’t sold here for me to try! I live in Texas and I would have to go to Oklahoma City to get them even to try (unless I ordered online of course). Having to learn a more paleo diet since no gluten, dairy, and just added no yeast. The tropical ones sound tasty. I would love to win because I am currently transitioning to Paleo and these cookies are a bit outside my price range. The alpine variety sound delicious! The original flavor ones sound the most tempting to me — but they all sound great! I get your updates via RSS feed. The Alpine variety sounds like it would be my favorite, but they all sound really good! New follower here! Due to a family emergency my family and I are completely dairy, soy, and gluten free — I would love to win this giveaway to kick start our new way of living. The original sound pretty tasty, and the Alpine sound like dessert! They all look delicious, but Tropical looks the most tempting! All the flavors sound delicious but the Tropical sounds the best to me! commented on fb and am going to share … tho i want to keep this all to myself!! I’ve tried all the flavors so far and the Tropical are my favorite! Such a yummy, warm coconut flavor. Great for snacks! Sorry, forgot to say I would like the original best. I like you on facebook. I subscribed to you through Google reader. The Alpine Cookies look amazing! I would love to try these cookies because I love cookies but am trying to go Paleo. Is this giveaway open to international readers? I like gfe on FB as Sara Donahue. The Alpine cookies sound best, but they all sound yummy! I LIKE Caveman cookies on Facebook! 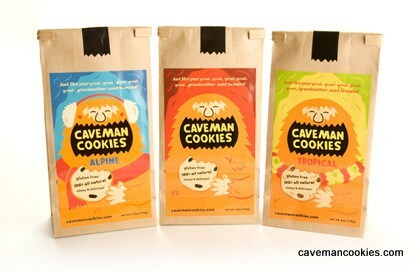 I think the tropical caveman cookies sound really yummy! Love all the Caveman Cookies…I buy mixed cases usually, but Tropicals are my favorite! Love the name and I am game to try them all, although the original and tropical definitely sound rightup my alley! I’m super sensitive to sulphur dioxide so am happy to know that they are unsulphured! Love trying gluten free cookies. These sound great. Pick one to try? They all sound so yummy! I do love coconut so I would definitely want to get my hands on Tropical first!! Me like Caveman Cookies on fb! Me like gfe on fb too! The Tropical cookies sound amazing. I can’t eat any grains so these cookies are right up my alley! I get recipes and info from gfe by email too. I WOULD LOVE TO RECEIVE SOME CAVEMEN COOKIES FOR MY TRIP TO NORTH DAKOTA. I NEED TO TAKE SOME SNACK ITEMS AND THESE WOULD SURE HIT THE SPOT. THANK YOU FOR THIS OPPORTUNITY. I subscribe to GFE emails! Hmm, giveaway? I have so many relatives/friends that are newly GF – these would be perfect for the GF Gift Baskets I am putting together for them! I would love to try the alpine cookies, but really any of them would be great! I would love to win this- chocolate would be my choice!! I get GFE in my email box!! Thanks!! I would love to try the Alpine cookies! They sound yummy & I’m always looking for ways to add more fiber into my diet. I subscribe to gfe in my RSS feed & by email! I liked Caveman Cookies on Facebook. I would LOVE to try these! I love to bake GF, but having special treats on hand helps to keep me on the right track! the Alpine cookies sound delicious! It’s nice to see that all their ingredients are natural! The Alpine sounds yummy, I love nuts. These sound so good! The Tropical sound delightful – anything with macadamia nuts is appealing! I also subscribe to your blog via feed (of course). Heck, they all sound yummy to me! And their logo is very cool! All of the flavors sound delicious. If I have to pick one, I’d like the Tropical. Coconut and ginger in them sound so tasty, yum! 🙂 Thanks for this giveaway. What a fun name – love it! I would like to try the Alpine Cookies. The Alipine cookies look delicious. Cool prize Shirley! If you like this product, then I know it is a good one too. I’d love to try the Alpine cookies most. I adore carob, but it is used in so few products that are dairy-free! The Tropical flavor sounds the best to me! Did this as well….not sure where to leave the comment. The Alpine Caveman cookies sound the best. The original flavor sounds yummy-est to me! Would love to try them all! Like GFE on FB !! The Alpine sound delicious! Thank you for the chance to win. I follow gfe on Facebook! I *like* Caveman Cookies on Facebook. I would like to win this for my daughter. She spent YEARS being miserable before she found out gluten was her enemy. She works two jobs trying to make ends meet and staying gluten free isnt easy for her to do on her minute income. She would absolutely love to have these products! I get the newsletter by email. I’m not sure if Canadians may enter, but the Alpine cookies look great to me. They all look delicious, but I am partial to macadamias, so the tropical would be the winner for me! The original are my favorite…..they make a great pre-wokout snack!!! I LOVE COOKIES!!!! and if I can get my cookie fix while still being PALEO friendly then life would be SOoo much better and I’d be a HAPPIER Man! The Tropical, almond/macadamia/coconut + ginger ones sound absolutely amazing. Gluten free, and Paleo? Woohoo! would love to try them all! sound delicious. Those tropical cookies sound fantastic. I’m a big fan of coconut. I would love to try alpine. The Alpine cookies for sure! The Alpine cookies sound awesome. Just starting gluten free – these coookies would be great to try. Alpine cookies sound amazing! Would love to win these. I love how the ingredients are so simple and natural. The alpine cookies would be my top pick! What a great giveaway! Thanks Shirley!! Holy Cow, these sound delicious! Original, with ginger & cinnamon sound great but I avoid raisins due to my sensitivity to grapes. Both Tropical & Alpine sound yummy, too. Send me all three when I win the giveaway! I think the tropical cookies sound best! I would love to win because it would be great to try out a nutritious, delicious, Allergy friendly, and adorable snack! 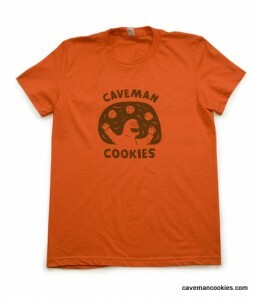 I liked Caveman Cookies on Facebook! I signed up for emails from Gluten Free Easily! I shared the giveaway link on Facebook! I’ve never tried delicious sounding Caveman Cookies, but I’d like to enter the contest so that I can! I like Caveman Cookies on FB. The original ones sound best to me. The alpine sound delicious but I’d really like to try all of them! The Alpine cookies sound wonderful! How exciting. I won!!! I can’t wait to try them all out!